Most of us are clueless when it comes to the physics that makes our modern world so convenient. What’s the simple science behind motion sensors, touch screens, and toasters? How do we glide through tolls using an E-Z Pass, or find our way to new places using GPS? In The Physics of Everyday Things, James Kakalios takes us on an amazing journey into the subatomic marvels that underlie so much of what we use and take for granted. Breaking down the world of things into a single day, Kakalios engages our curiosity about how our refrigerators keep food cool, how a plane manages to remain airborne, and how our wrist fitness monitors keep track of our steps. Each explanation is coupled with a story revealing the interplay of the astonishing invisible forces that surround us. 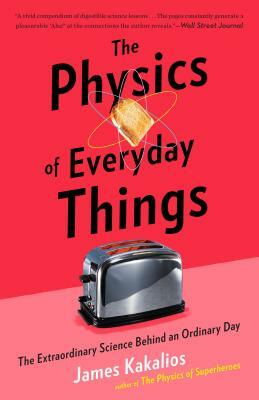 Through this “narrative physics,” The Physics of Everyday Things demonstrates that—far from the abstractions conjured by terms like the Higgs Boson, black holes, and gravity waves—sophisticated science is also quite practical. With his signature clarity and inventiveness, Kakalios ignites our imaginations and enthralls us with the principles that make up our lives. JAMES KAKALIOS is the Taylor Distinguished Professor of Physics at the University of Minnesota and the author of the bestselling The Physics of Superheroes.